The Northern Ireland Food and Drink Association launched its 2016 Manifesto this week, calling on the Executive to help support Northern Ireland’s largest industry through a range of targeted measures. 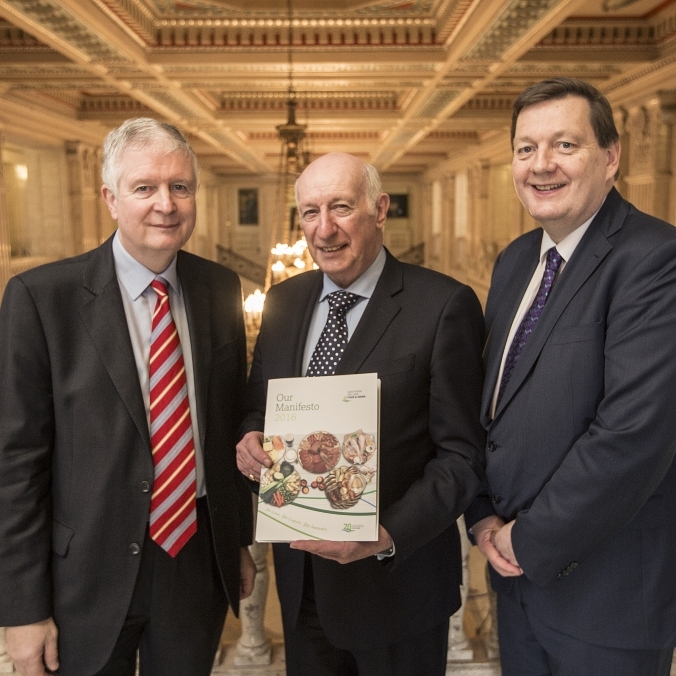 Ministers, MLAs and NIFDA members gathered at the event, which was held at Parliament Buildings, to learn how NIFDA aims to create more jobs in the local food and drink sector over the next three years with the support of the Executive. NIFDA Chairman, Dr David Dobbin, told those attending that the local industry needed the continued support of the NI Executive and Assembly if it was to continue to grow into existing and new export markets. In particular he urged the Executive to move forward with the implementation of a food export marketing body as a priority item. “Our target is to grow our industry’s turnover to £7bn by 2020 and create 15,000 new jobs as outlined in the ‘Going for Growth’ report, however we need the continued support of the Executive. In the NIFDA Manifesto we outline a range of issues which require the Executive’s support to create an environment which will improve our international competitiveness and allow us to generate sustainable growth through increased export sales,” said Dr Dobbin. “As Northern Ireland’s largest employer, we believe that the agri-food sector should be the cornerstone of the Executive’s economic strategy. We call on the Executive to work with us to keep our cost and skill base internationally competitive and help market our excellent food and drink products, especially in key external markets. We need to address our higher energy costs, maintain rates relief for food manufacturers and get the food export marketing body up and running. We need government to continue its support for innovation and technology advancements within the sector, and to promote skills development and sector attractiveness. We have an excellent platform upon which to grow the sector – with world class innovation, food security and quality standards – and we are confident that with continued government support the industry will continue to be a leading light in the local economy and a major creator of new employment,” he concluded. The NIFDA Manifesto is available to download here.